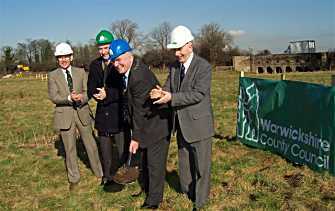 County Councillors and local MP Mr James Plaskitt cutting the first turf in the construction of the Barford bypass on Friday 10th February, 2006. The northern junction was opened recently and the completion ceremony on May 14th saw the unveiling of the commemorative bench and plaque at the southern end of the old river bridge by the Chairman of Warwickshire County Council, Councillor Chris Davies, with speeches by John Deegan, Head of WCC Transport and Planning; Mr James Plaskett MP; Martin Heatley, WCC Portfolio holder for the Environment; and Mr Steve Walsh for Galliford Try the contractors. It has been notable how many people are now walking down to the old bridge and viewing the river and bypass and the new bench offers a lovely view over both bridges and the river setting. Click here for photo gallery (see galleries 30 and 34). The Warwickshire Museum has recently posted a summary of the archaeological fieldwork commissioned by the County Council during the construction of the Barford bypass. Warwickshire County Council published the Side Road and Compulsory Purchase Orders for the A429 Barford Bypass on the 18th December 2002. Objections were received, and a Public Inquiry was needed. A Public Inquiry into Barford Bypass scheme Compulsory Purchase Orders and Side Road Orders was held at Charlecote Pheasant Hotel in September 2003. The Inspector was Mr William Hutchinson who ran a very well organised but quite accommodating event. He started by clarifying that matters of pure Law, Government Policy, Design, Need and Compensation were outside the remit of the Inquiry, and would not be considered. He first heard the case for the Barford Bypass, presented by Warwickshire County Council (WCC) and various experts. This was followed by cross questioning by the WCC legal counsel, objectors, members of the public and then a summing up. The Inspector then heard supporters, statutory objectors (with land interests in the scheme) and non-statutory objectors, all of whom were subject to similar cross questioning. The Inspector was extremely tolerant of amateurs and professionals alike and clearly had an excellent knowledge of the local situation. The formal situation finished with a summing up by the WCC QC before the Inspector carried out his second site visit – visiting Wasperton, Oldhams, Westham Lane, Barford Riverside, Sherbourne Park, Sherbourne Corner and Longbridge. The Public Inquiry result was published in Spring 2004. The Inspector’s report was comprehensive and was supportive of the scheme. The official response from the Office of the Deputy Prime Minister was “The Secretary of State does not consider that the objections, singly or together, constitute grounds for not proceeding with the proposals”. This should leave Compulsory Purchases to be made and tenders to be invited and accepted before the works can be considered further. Early in December 2004, an announcement from Transport Secretary Alistair Darling confirmed final approval with the allocation of £10 million for the Barford by pass. Construction is expected to begin in Autumn 2005. Construction work would then take about 18 months. Rumours about the bypass are numerous, but it is not true that the A429 Bridge Street will be closed during construction, and it is not true that the proposed junctions will be unprotected as they will have full hatched ghost islands, physical refuges, lit bollards and hat-pin illumination, along with a hatched reservation area between turning vehicles and opposing traffic. The waiting space for turning traffic is calculated according to the number of turning movements expected in consideration of the prevailing traffic speed. The following information is taken from a summary of the Environmental Statement, non-technical summary, for the proposed A429 Barford Bypass. The complete Statement consists of 2 volumes, the first addressing subject areas such as air quality, visual impact and landscape, ecology, water quality and road traffic noise. The second document contains supporting drawings and maps. In December 1997, Warwickshire County Council granted Planning Permission with Conditions for the construction of a new length of the A429 to bypass the village. Subsequent alterations to the scheme mean that the proposals need to be re-submitted. The appropriate orders for the acquisition of land and necessary side road orders will be published in Autumn 2002. The bypass would be 2.1 km (1.31 miles) in length and be aligned to the west side of the village. It would consist of a 7.3 metre wide kerbed road, widened at the southern and northern junctions to provide right-turn lanes. The verges would generally be 3.5 metres wide, with widening where necessary to provide adequate visibility. There would be a four span viaduct and series of flood culverts where the bypass crosses the River Avon and the flood plain. Subject to obtaining planning permission and making the legal Orders for the scheme, construction of the bypass would begin in 2004 and could be open by the end of 2005. The construction period is anticipated to be 18 months. Disruption to traffic using the A429 during construction would be minimal. Construction traffic would be required to access the site using designated routes so minimising vehicles travelling through the village. The use of other roads would not be allowed. The A429 is a Primary Road, linking Warwick and the M40 and A46 trunk road to the north, with Wellesbourne, Moreton in Marsh, Stow-in-the-Wold, Cirencester to the south. The continued economic growth at Wellesbourne will increase traffic flows through Barford. As this growth has been predominately large distribution centres, the percentage of heavy goods vehicles passing through the village will continue to increase. The noise, fumes, vibration and dust generated from heavy traffic passing in close proximity to residential properties on the main streets of Barford has adversely affected the quality of life for the residents. Many of the inhabitants claim that the traffic problems are now at an intolerable level and can only get worse, particularly for pedestrians and cyclists. The existing A429 creates a division in the community, isolating residents on the western side of the road from the school, recreation ground, shops, village hall and church. The volume of traffic also results inn the environment being dangerous and unpleasant for pedestrians and cyclists, which is highlighted by a recent fatality. The condition of the existing Grade II listed Barford Bridge, which carries the A429 over the River Avon immediately north of the village, is currently deteriorating as a result of the number of heavy goods vehicles which use it daily. It is considered that the structure would require major maintenance, strengthening and refurbishment works in the near future to maintain the fabric of the bridge, and result in significant disruption to road users. There have been numerous accidents, which have generally occurred in the northern half of the village, at the junction with Church Street and length of road over the river bridge. There are frequent traffic delays centred around the Bridge Street/ Wellesbourne Road junction which also aggravates the situation with regard to noise, air quality and vibration with vehicles stopping and starting.